The Irish Society of Urology gathered in picturesque Co. Roscommon for its annual scientific meeting, the home place of this year’s president, Mr Eamonn Rogers of Galway University Hospital. The academic activity began on Friday morning with the first podium session on General Urology, featuring papers on topics ranging from laser prostatectomy to Paediatric Urology. Next up was the first of two poster sessions, with short oral presentations of 19 posters in General Urology. The second podium session, chaired by Ms Catherine Dowling, consultant Urologist in Galway University Hospital, and Mr David Galvin, consultant Urologist in St Vincent’s and The Mater Misericordiae University Hospitals, was dedicated to prostate cancer, featuring 6 oral presentations on TRUS biopsy related sepsis, male slings for post prostatectomy incontinence, intraductal prostate carcinoma, prostate cancer survivorship and salvage prostatectomy. It’s always enlightening to hear from other members of the multidisciplinary team, and as such it was particularly interesting to hear a presentation from Ms Mary Cremin (@marycremin1), prostate cancer survivorship clinical nurse specialist in St James’s Hospital, on the Men and Sexual Health Prostate Cancer (MaSH-PC) study. Closing out Friday’s academic activity was the third podium session on Urologic Oncology. We heard two papers on penile cancer, a review of minimally invasive partial nephrectomy in Ireland, and 3 papers on bladder cancer, including a 21-year review on changing incidence of bladder cancer from the Dept. Urology at Tallaght University Hospital, which has since been featured in The Irish Medical Times. Saturday morning continued with high quality poster presentations: The team from Waterford University Hospital encouraged considerable debate about extending the need for HPV vaccines in young men with discussion of the potential increased risk of both penile and bladder cancer (Ms. Aisling Nic an Riogh (@aissparkle) and Mr. Kenneth Patterson), which was featured in a piece by Danielle Barron in The Sunday Times the next day. The afternoon saw a presentation from the overall research award winner Ms. Stephanie Croghan, with a detailed presentation of outcomes from 100 Transobturator Tape Procedures from the St. Vincent’s Healthcare Group. This led the way for an excellent presentation from Mr. Jeremy Ockrim “The Mesh of My Life-Where Are We Now?” allowing for active debate and discussion about the future of mesh related surgery in Ireland and the U.K. going forward. Ms. Eabhann O’Connor, fresh from a year in London, gave numerous presentations from Mr. Ockrim’s group including a cadaveric pilot study of intra-urethral bulking agents for post prostatectomy incontinence. The Urological Oncology podium session saw lively debate about access to MRI scanning, timing of prostate biopsy and survivorship programmes in men with prostate cancer. The sessions concluded with presentation of awards, with Mr. John O’Kelly receiving best podium presentation for his assessment of referral patterns for boys with undescended testes from Cork University Hospital. Ms. Stephanie Croghan was awarded the best poster prize for her review of ureteric stenting, and the overall research prize. Ms. Anna Walsh was also rewarded for her outstanding results in the recent FRCS urology, an exceptional achievement. The Anthony Walsh/Ipsen Travelling Fellowship recipient Ms. Eva Bolton was acknowledged in absentia, as she has already commenced her fellowship programme in London. The Irish Society of Urology annual meeting has a strong tradition of attracting world class guest speakers, and this year was no different. We were joined by Dr Kent T. Perry Jr. (Co-Director of the Minimally Invasive Surgery Program & Associated Professor at Northwestern University Chicago), Professor Hendrik Van Poppel (Adj. Secretary General of EAU for Education), Mr Jeremy Ockrim (Honorary Lecturer and Consultant Urologist at University College London), Mr Kieran O’Flynn (Immediate BAUS past president and Consultant Urologist at Salford Royal Foundation), and Dr Matthias Hofer (Assistant Professor at Dept. Urology, Northwestern University Chicago). The excellent programme of guest speakers started on Friday afternoon with Dr Matthias Hofer’s talk on urethral reconstruction-a ‘no frills’ overview of a complex topic which surely inspired several trainees in the room to consider a career in Reconstructive Urology. Dr Kent T. Perry delivered a fantastic talk on the management of small renal masses. Prof Van Poppel’s lecture entitled “How We Make Muscle Invasive Bladder Cancer Surgery Easier and Better”, accompanied by excellent videos of the operation, was very well received and generated lots of discussion around the centralisation of radical cystectomy. On Saturday we heard another excellent talk from Dr Matthias Hofer on the management of male urinary incontinence, as well as one from Mr Jeremy Ockrim on the future of mesh surgery. 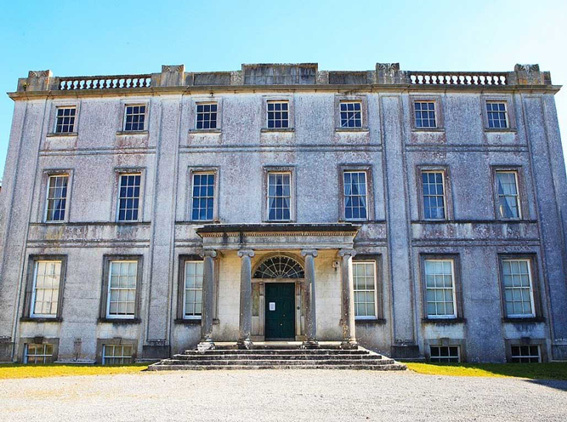 The Saturday formal dinner was held in the historic Strokestown House in Roscommon-the former home of the Packenham Mahon family, built on the site of a 16th Century castle, which was home to the O’Conor-Roe Gaelic Chieftains. It is now the site of the National Famine Museum. We were treated to a fascinating tour of the house on arrival, before enjoying a wonderful dinner, and some fantastic harp-playing. The presidential chain was conferred to the incoming president, Mr Paul Sweeney of The Mercy University Hospital in Cork, and the society are already looking ahead to exciting things during his tenure as president.